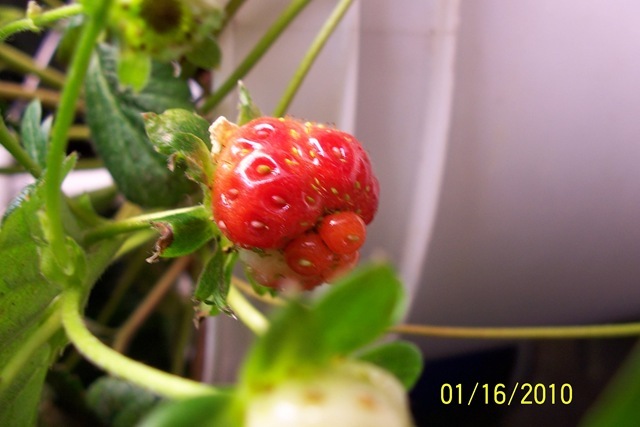 The coldest week I’ve ever experienced in Florida ended yesterday…and today I have my first strawberry! Love that splash of red, lavender is behind, lettuce to the right. Of course, outside is decimated..except the lettuce which sprouts up and is 5 inches high. Yep, it made it through 21 degree weather, 5 nights of hard freezes. It was the seed from the lettuce plant I let go to seed. It was sprouting out from under the plastic I had covering the soil in the sub-irrigated grow bucket…hung in all summer. Sprouted 10 days ago. So that got me to thinking about how hardy it was..that led to searching on garden forums for a hint of why. And viola! Winter Sowing. 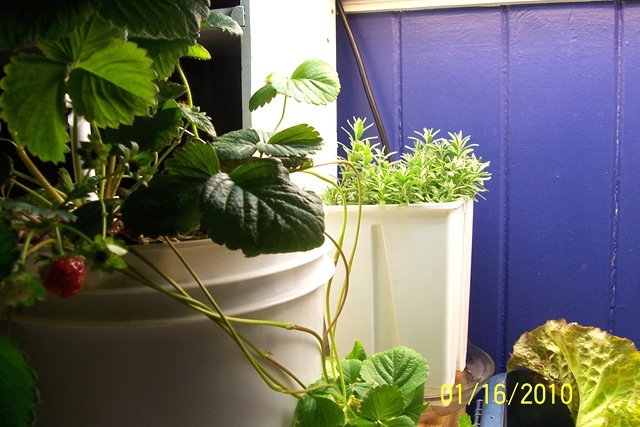 I’m really tickled about this and you’ll see why..
Winter Sowing is done outdoors during Winter using mini-greenhouses made from recyclables; there are no heating devices, no energy wasting light set-ups or expensive seed starting devices. You can learn How to Winter Sow Seeds Outdoors.The FAQs (frequently asked questions) will show you many different tips and techniques for Winter Sowing, they are written in a friendly and encouraging manner. The Winter Sowing Method adapts easily to fit everyone’s own needs and skill level. Because the method is budget wise it can fit into everyone’s wallet size too. Amazingly, just when Winter is about to break, and you’re still getting nightly freezes, the first of your flats will begin to germinate. When I saw this I thought that the seedlings were goners, but they thrived. The seeds know when it’s safe to come up; it’s part of their genetics. Now is the time to check the moisture in the flats. On an above-freezing day, open them up and if they look like they need a drink give them one. The excess water will drain away. Don’t forget to replace the lids tightly. And all the hardening off, winterizing, makes for tougher, hardier plants! So go read these simple instructions.. I’m fixing to start new veggies inside, but I’m also going to experiment with this method and I’ll keep you posted along the way!